In Wonder Woman, director Patty Jenkins places a perfect human being right in the middle of the starkest of horrors humanity is capable of and asks us to consider her, as she in turn considers us. Not that Princess Diana of Themyscira (Gal Gadot) is a human being. She is an Amazon, one of an ancient race of female warriors created by Zeus himself to defend humanity. The daughter of Zeus and of Queen Hippolyta (Connie Nielsen), Diana is much more than a mere Amazon. Goddess is a more apt description, and not just to be complimentary. With her bulletproof gauntlets, glowing golden Lasso of Truth, and her unshakable belief in herself and in the best of humanity, Wonder Woman is who all the world has been waiting for. As Hippolyta says, the world doesn't deserve her. To which, Diana learns, sometimes it isn't about what you deserve. Thank gods. As confused and occasionally repulsed as Diana is by the world she finds beyond her island paradise, she believes mankind is simply being coerced by Ares, the Greek god of war, who is the last survivor of the Greek pantheon after murdering all of his siblings, including Zeus. Diana believes wholeheartedly that she must simply kill Ares and it will end not just this war, but all wars, forever. As cultured and learned as Diana is in many other respects, her naivete in this matter is downright charming. Who Ares is and where he's hiding is a mystery, though all signs point to General Ludendorff (Danny Huston), the German leader who wants nothing to do with signing an armistice that signals Germany's surrender, preferring to gas everyone he can thanks to his pet chemist Doctor Poison (Elena Anaya). Finding out that human beings aren't completely under the thrall of an evil god - that people, including Steve Trevor - are messy, complicated, and prone to having all kinds of petty failings, is a crisis of conscience for Diana. In the end, what makes Diana a superhero - what makes her Wonder Woman - isn't her incredible power or prowess in battle, it's her ability to find empathy for people, even those who don't deserve it. "I wish we had more time," Steve says to Diana, and we agree. At times, Wonder Woman feels a bit slight with its superhero origin story meshed with a gruesome war movie - though there are lots of familiar odes to Justice League director Zack Snyder's 300 as well as echoes of Wolfgang Petersen's Troy and Captain America: The First Avenger - right down to a blond soldier named Steve concluding the movie by hopping in an airplane and flying off to his doom. (Not to mention Wonder Woman's spiritual predecessor, Richard Donner's Superman: The Movie.) This is a film that could actually have been even longer, with more connective tissue to add more robustness, especially to the villains and all the characters who aren't Diana and Steve. 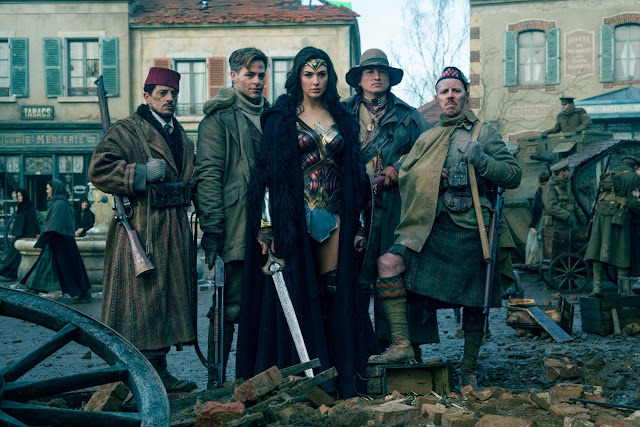 Yet there are moments in Wonder Woman that truly sparkle, like Diana and Trevor's conversation and first night "sleeping together" on a boat, Diana's interactions with Etta Candy (Lucy Davis) in London, and a magical night in a tiny town in Belgium after Wonder Woman spectacularly liberated it from the German army. Even more moments like these would have been wonderful. 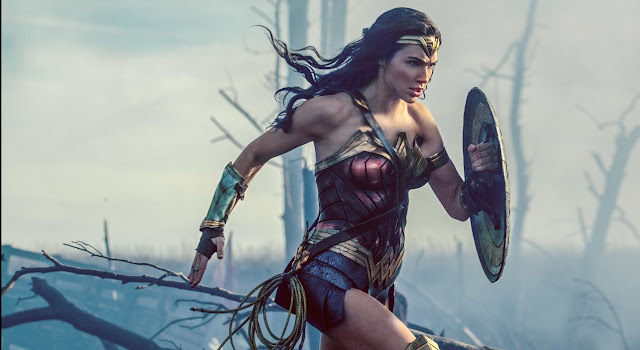 What makes Wonder Woman work - and why it rises high above its brethren in this current era of DC Comics superhero movies - is Patty Jenkins, who completely understands the power, grace, majesty, and boundless capacity for empathy that makes Wonder Woman special, and Gal Gadot, a magnetic, endearing screen presence who ranks with Christopher Reeve's Superman and Robert Downey, Jr.'s Iron Man as a most perfectly cast actor to play her chosen superhero icon. Jenkins proves time and again, both in quieter character moments between Diana and Trevor and in a handful of truly awesome action set pieces - the No Man's Land centerpiece battle is one of the all-time greatest superhero movie action sequences - that she knows exactly who Wonder Woman is and what we want to see her do. In Gadot, she has the greatest partner, a superstar born for this role you can't take your eyes off of, who delivers above and beyond, and makes you believe in Wonder Woman. Most importantly - because gods know we need it - Wonder Woman believes in love, and in us. Thank you, that was astute and quite moving. I too found Gal Gadot captivating as Wonder Woman. I wanted the world to be better for her. The fight scenes were lyrically beautiful and brutal. I did find myself wishing the writers hadn't gone the "god" route. I don't know if that's the original intention of the comics but I find that being a god is a little like the end of the road when it comes to further plot development. Other than other gods (and they're ostensibly not a dime a dozen), who can fight you? In addition, the actor playing Aries didn't seem suited to the part. He looked silly, even in his fantastic suit of steel and fire. Other than that, this movie shone. And Gal Gadot was truly divine.